Wow your friends and audience with an incredible Fire Dragon Staff Performance. Do you sell beginner dragon staff or collapsible dragon staff? All our dragon staff for sale are collapsible. The collapse down all the way down to the hub parts. For beginners most do jump straight into it. We do have the matrix dragon claws available that work with the matrix dragon kit perfect for practice spiral dragon staff and beginner dragon staff. Do you sell a pixel dragon staff? Currently we do not have one available. Does the matrix or Home of Poi dragon kit fit on the Home of Poi dragon stick and the Fusion dragonstaff? Yes both dragon kits work with both the Home of Poi dragon fire staff and Fusion dragon staffs. Where can I find dragon staff tutorial? Currently most use youtube to find dragon staff tutorials for dragon staff fire. Get in on the dragon craze and buy dragon staff now. "This is a fantastic collapsible staff, it's super easy to travel with. It is worth noting though that this is the heaviest staff I've encountered any spinner using. While this is fantastic news to me since I'd generally prefer all props to be as heavy as possible, it's worth noting that many of the people I've let spin it came away with the conclusion that it is clearly much too heavy for them. If you like heavy props this is absolutely the staff for you. If you'd like a light staff you should look for something else." "This is my first dragon staff and it's everything I hoped and more. It's easy to collapse down and put back together, perfect for traveling. The gross and weights are excellent on it and it can break down to a contact staff. It's better than my current contract staff even. Highly recommend." "Well... 7 of them were ok but one was too big so we had to fix it! Rest as always!! Perfect!!" "Never had to use it, but I'm glad I have it just in case. It has snaps on it that you can rip open very fast!" "Item came in good condition , nice packing and delivery was fast. you can expect quality item from home of poi as usual. recommended." "Great service fast shipping in love with my dragon staff!!" "SO happy with this staff. Arrived sooner than expected with no problems. Will definitely recommend Home Of Poi." "Great product so far. Very durable. Allen key tightening can be improved"
Dragon for me, Contact Staff for my boy. "My son spins Dragon and has been wanting to learn contact staff (he's 9). This staff is perfect for both of us! It's much lighter weight than the one I had been using, and flows very nicely." "Fast delivery and excellent product. Very well crafted." "Ordered around christmas/new years and was AMAZED at how fast it shipped here. The weight and grip are perfect and the staff is so easy to assemble/disassemble. Way satisfied"
"I was a little bummed to find out they don't make replacement push button spokes for the old model so I had to buy a whole new kit instead of just swapping out one piece after a little accident. This new version is almost identical to the one that was out 3 years ago. Worth the money. Happy to be back at it." "I apparently didn't read the description too well before I purchased this, but its actually gigantic and intended for putting out an entire person. So I cut it in half and stitched up to prevent fraying and gave the other half to a friend. It's still too big ha." "Excellent purchase as described in item description. My son was extremely happy with his Xmas present and can't wait for the next doof. The online Staff lessons will ensure he is ready to entertain." 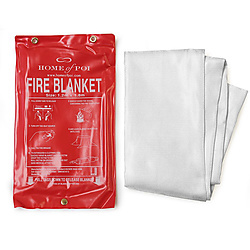 "Easy to use fire blanket! I haven't had to use it yet, but the snaps make it easy to get out of the package." Super Big Fire Safety Blanket! "Love the large size and the pouch it comes in." "The staff is amazing and it came in record time. My wife is going to love it." "Fire blanket is great quality and comes in an awesome carrying case... Every fire Kit should have one"
"My fire blanket arrived quickly and in pristine condition for me to get dirty! Can't wait to start the fire shows now that my safety equipment is here! Thank you home of poi for helping me warm up my winter without burning it down!" "Nice Dragon Staff. I love the easy way to built it up and down for transportation. :-) Thanks"